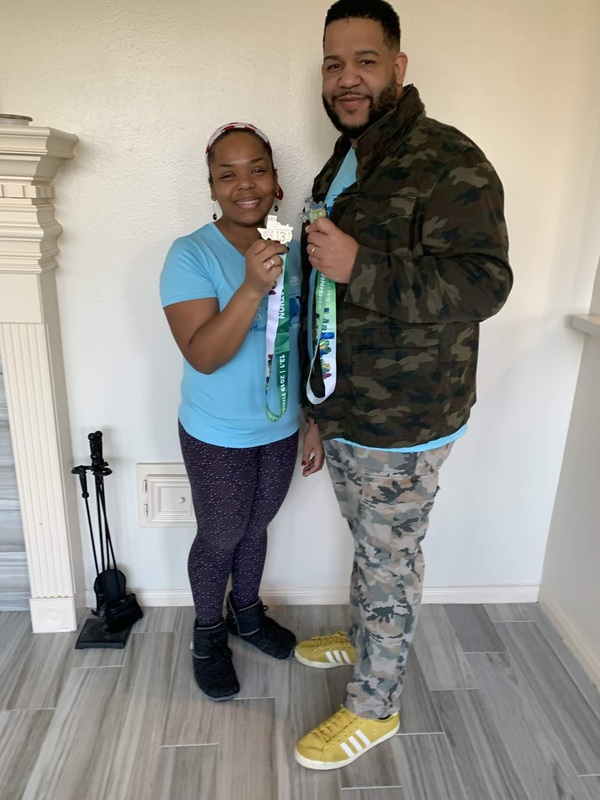 My husband and I completed the Aramco Houston Half-Marathon last Sunday. It was my first time running the half-marathon in Houston. 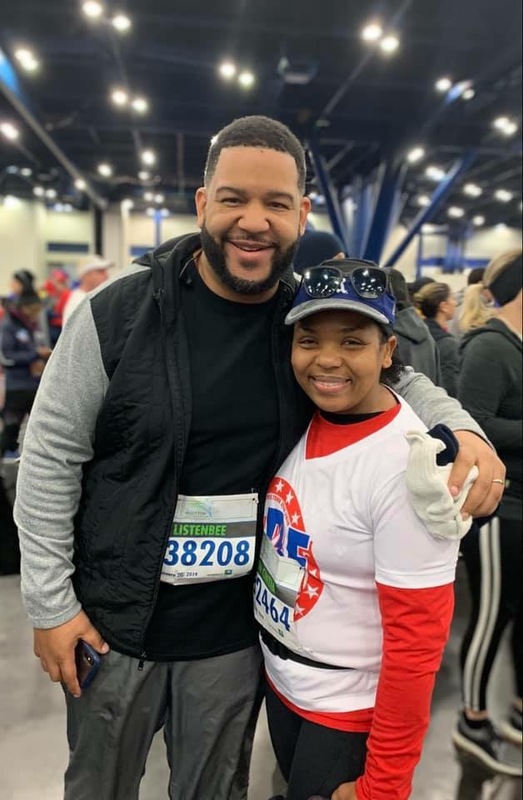 So far, I've been blessed to run 5 marathons and now, 5 half-marathons. Zeke and I have a lot of help when it comes to training and finishing long distance races. It truly takes a village. We have a sweet friend who keeps the kids while we run the half, which makes it easier on this mom's heart. We took the whole family to the expo on Friday. We noticed it was a two-step process to pick up our bib instead of the usual one step. The volunteers we friendly and helpful. I also noticed that the registration was held in a different room than the expo. We picked up our bib and went to a different room where the expo was. There were a lot of vendors, and tons of photo booths. We really enjoyed that. The participant t-shirts were in the back of the room. We picked up ours and walked around the expo a bit more before they closed. The kids had a great time. I learned from previous experience that doing too much the day before backfires when you need to race. I rested part of the day and prepared everything for the kids and myself for the next day. I took my flat Cintia picture, which was great because I noticed all the stuff I was missing. Went to sleep early and I woke up earlier than planned. I thought, no problem, I can read my Bible in a Year and get started with my day. It was 33 degrees that morning. I stepped outside and felt good about my clothing choices. A note on my training. I trained at 5 am twice a week for 32 weeks. A lot of those mornings were very cold. During those opportunities, I fine tuned what I needed to wear during cold weather. A lot of people made fun of my decision to train during cold days. I'm the person who benefited from getting out and training in the cold. Training was not easy or convenient but it was worth every dark and uncomfortable run. When we got to the GRB, it was early enough that I could attend the Protestant worship service. As we were singing praises to God, I cried and I expressed my thanksgiving to God for allowing me to be back after my sabbatical last year. The message that morning was about being thankful to God. I remember the pastor, who was running the half that morning say, "God is in control, let's be thankful." I went out to meet my running group. I'm thankful to God for them. They successfully helped me train for all of my races. The friendships I gained are priceless. I gave a lot of hugs and wished everyone well on their races. Zeke and I used the restroom before we left (great move). We went to our corral and waited in the 36 degree weather. It was windy too but I had one of those thick trash bags around me to cut down on the chill. Once the race started, I got ride of the trash bag. I had visualized how I need to finish the race, so I worked on my goal immediately. My goal was to finish strong, feeling great, standing up straight. Simple right? I followed my plan to run a mile and walk one minute. I told myself not to look at my pace, just run strong and enjoy each mile. When I was on mile 7, I saw a text from my friend saying one of my kids had a fever. I immediately took my gloves off and texted her back with instructions for treatment. I asked her to text me back so I could check on my kid. I then noticed one of my gloves fell. I started to run back to grab it. I got some ugly looks from the runners (I do not blame them at all!) but I've had those gloves since my first season of marathon training. I couldn't leave my gloves behind. I picked them up and kept running. I also turned on the gospel music. I knew the course well from miles 1 through 8. I've ran it 4 times before. Mile 8 is the big split between full marathoners and half marathons. For the first time, I took the left turn with all the half-marathoners. I basically ran and prayed the whole way in. I also enjoyed the Half-marathon course. It is flat! I was pleasantly surprised. Well, it is way flatter than the marathon course for sure. It was great to run through Main Street close to rice. Those fountains by the Museum of Fine Arts are gorgeous to see! I took my bottle of water with me, so the only time I stopped was to get some Gatorade around mile 10. When I got to mile 11 I basically forgot about my intervals. I could see the elite athletes to my right. Now, that was an experience! Running the marathon course guaranteed that they were at the airport by the time I finished running my race - foreal. I kept running and it was interesting to be feeling that great that late in the race. I kept going. When we got close to mile 13, someone on the full course fell down. I alerted one of the course marshals who ran back to help the poor man that fell. When I got close to the finish line, I noticed a lady to my left was walking. I tapped her on the shoulder and said "come on, the finish line is right there." She started running super fast and zoomed past me. I then took a close look at the finish line. I started crying and thanking God for the opportunity to finish one more race. My heart was full. My time was 2:38:11, 5 minutes short of my PR. This time does not describe the gratefulness I am still experiencing. This time does not define me, my training and what I am able to run. This time is simply a reflection of what God allowed me to do that day. For that, I am incredibly thankful. I finished before Zeke, which was weird cause he usually takes naps waiting for me to come through the finish line. He too had a great race. Thanks to God, our kids' fever went down and she was feeling well by the time I was finishing the race. Today, two days after the race, I'm not as sore as I remember. Running a half-marathon and not killing myself in the process does have its perks. I want to thank God for giving me the opportunity to do what I love while feeling well. I want to thank God for my husband, who is always there for me, who pays for everything (yep, running costs and Zeke pays the bill) and who is always patient with me and this hobby of mine. I'm proud of him for joining me in this adventure. 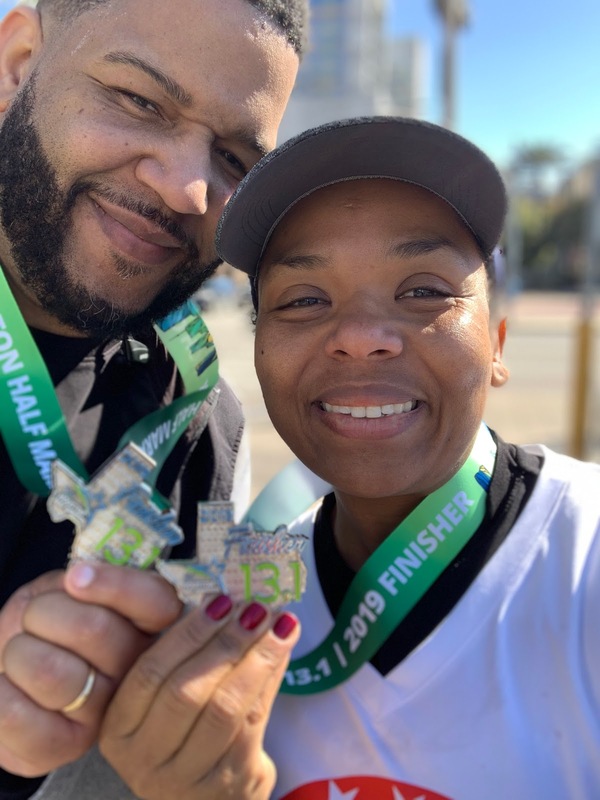 Celebrating our 13th wedding anniversary by running 13.1 miles was pretty epic. I want to thank my kids for riding their bikes while I was piling the miles in the neighborhood. They had to slow down for me and that was a sacrifice lol! I want to thank my amazing running group for running with me at dark o'clock. Seeing them reach their goals was a blessing beyond measure. I want to thank my running group for getting me to 5 marathon finish lines and 5 half marathon finish lines (not counting shorter distances). They have been in existence for 26 years and they really know how to get you from couch to the distance of your choice. Thank you my dear reader for joining me in this adventure! What's next? I entered the NYC marathon. It's a lottery and it's not my first time trying. If I get in, you will be reading about my training. If not, I will be training for something else as exciting. Regardless of the goal, I will be running.